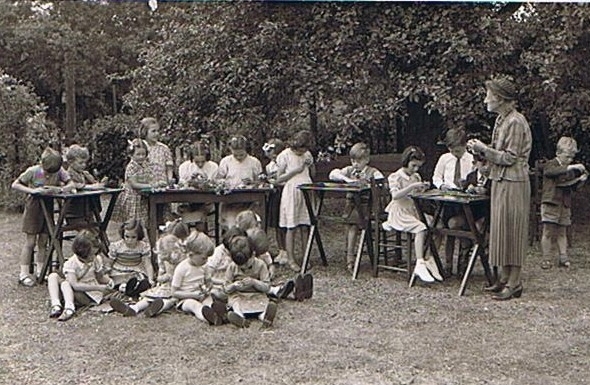 Goldings School - Miss Norman with pupils in 1953. John Richards family kept this newspaper cutting from 1953. 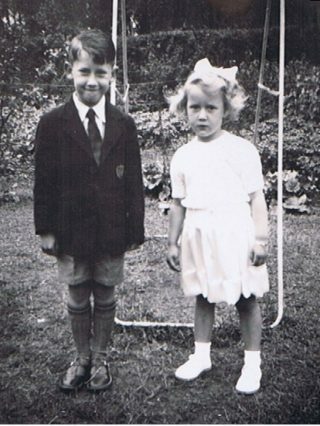 John Richards is the boy wearing a jacket sat next to Miss Norman. Both John and Anita attended Goldings School. Is the badge on the jacket part of a uniform for Goldings School? Goldings School in French Horn Lane was founded in 1909 and closed in 1953 when, according to the Herts Advertiser, Miss Norman retired for health reasons. Ada Norman was born in 1879 in a cottage in Hatfield Park where her father became head gardener. She was educated at Countess Anne School, Hatfield and the North London Collegiate School for Girls. Miss Norman was an enthusiast for open-air activity, and the doors and the windows of the classrooms at Goldings were rarely closed. Miss Norman died in 1967 aged 88. 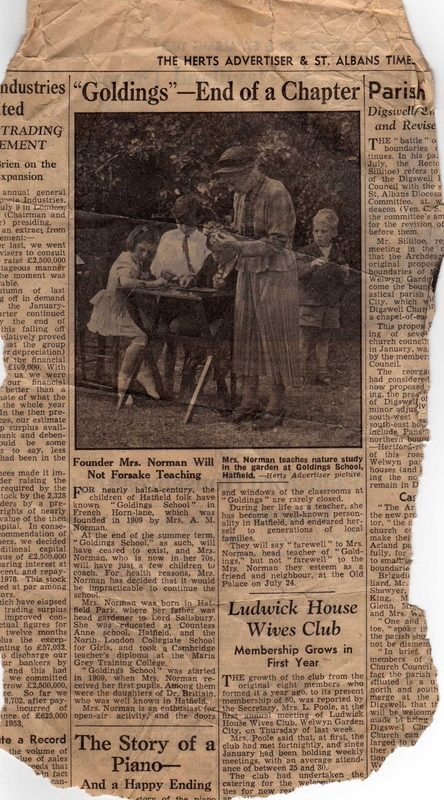 I attended Goldings School from 1950 to 1953 and my sister Anita from 1951 to 1953 and I can confirm that Miss Norman was a wonderful teacher. This page was added on 12/02/2014. Ada Norman was born in 1879 and died aged 88 in 1967. 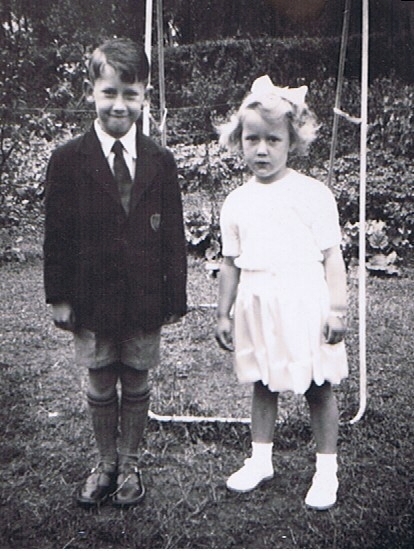 I attended the school from 1950 to 1953 and my sister Anita from 1951 to 1953. In the photo, I am the boy wearing a jacket sat next to Miss Norman and we believe Anita is the blonde girl sat on the grass and looking down at her work. I confirm that Miss Norman was a wonderful teacher. The garden seemed to me then like a field, and I remember the lessons outside. I remember playing with rope and the smell of rope today instantly carries me back to Goldings School. Miss Ada Norman was the daughter of the head gardener at Hatfield House and worked as teacher at St Audrey’s School. When her father died in 1906, she with her mother moved into No. 1 West Goldings Cottages in French Horn Lane. 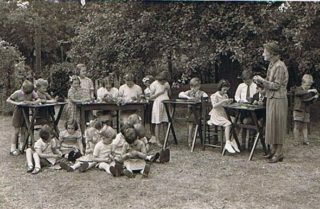 The 4th Marquess of Salisbury had built a wooden hut in the garden of the cottage for her and it was here that Miss Norman started her private kindergarten for 4 – 7 year old children c1934. It is reported that Miss Norman was a brilliant teacher and several prominent professional and trades people sent their children there. James Cecil, later Lord Cranborn attended there in 1956. If the weather was fine lessons would be held in the garden. Mrs. Bottomley who had taught in the original St Audrey’s and lived in an adjacent cottage assisted Miss Norman. During World War II the cellars of Hollier’s dairy were used as an air raid shelter. Miss Norman retired and closed her school in 1953.